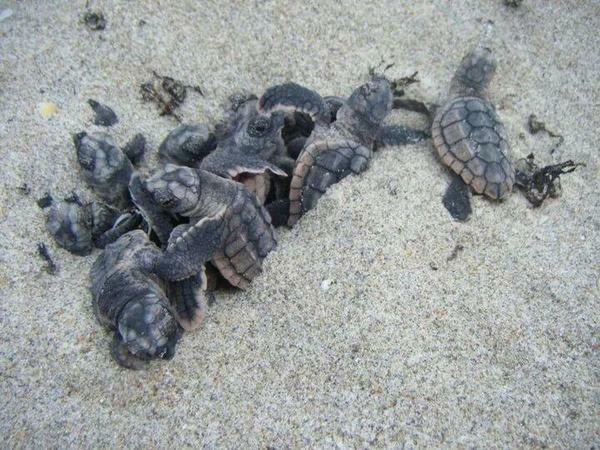 These baby Loggerhead sea turtles hatched earlier this season on a Broward County beach. Two sea turtles that were rehabilitated from illnesses are scheduled to be released Thursday morning in Juno Beach. Tiffany is an adult female hawksbill and Seabastian is a juvenile loggerhead. Staff at the Loggerhead Marinelife Center, where the turtles were treated, say they've recovered from infections and anemia. It's a much-needed piece of good news for some of the oldest creatures on earth. Sea turtles have been around for more than 110 million years, but humans' impact on the environment is making it harder and harder for them to survive. A red tide algae bloom on Florida's west coast this summer has killed dozens of sea turtles, as well as manatees and thousands of fish. Ocean pollution can make turtles ill -- particularly plastic bags, which turtles sometimes eat because of their resemblance to jellyfish. The number of male sea turtle hatchlings has declined, likely because of hotter nesting temperatures due to global warming and microplastics. And scientists suspect pollution and climate change may be playing a role in a virus that causes sea turtles to develop tumors. Tiffany and Seabastian are expected to be released from the Loggerhead Marinelife Center (14200 US Highway 1, Juno Beach) at 10 a.m. Thursday.